For at least half of my time working on this, I had this Cab Calloway song on repeat in my head. I caught the tabletop design bug again, but the unfortunately-timed hardware death of my development laptop was one of the many time sinks that meant the tabletop ideas I've been kicking around were too big to execute properly this month. I did, however, have one idea I'd brainstormed a while back that I kept coming back to, so I decided I should just dive into that, get it done, and see if there was anything to it in the slimmest and most streamlined form I could muster. The result is Blind Tigers, and it actually turned out pretty solid. The idea behind Blind Tigers is the tricky proposition of lining up the entertainment at US night clubs in the 1920s. This was the height of jazz nightlife and flappers and a whole lifestyle. It was also right in the middle of national prohibition of all alcoholic drinks, which made it the heyday of the speakeasy (sometimes known as a "blind pig" or "blind tiger" for somewhat interesting reasons) - underground clubs full of all manner of illegal liquor and elaborate drinks that mask the awful, awful taste of illegal liquor. This has all the makings of a push-your-luck game mechanic. You may be able to attract more customers with illegal attractions, but if you draw the eye of the police, you could lose it all. There's a lot of much nastier stuff that came out of this period, not least of which being the rise of organized crime under Prohibition, but I made a conscious decision to try to keep the theme light and casual and focus on the people who just wanted a good party and the clubs trying to make that happen. 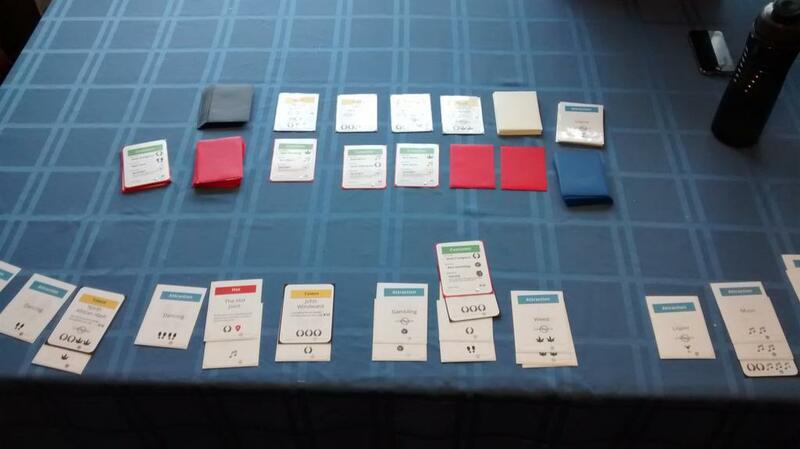 Blind Tigers is a light card game for 2-4 players. 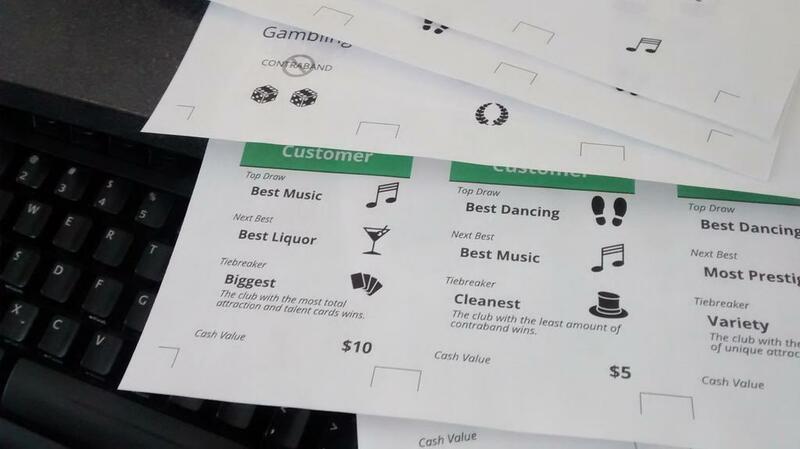 Each in-game "night" a selection of customers are revealed, each with their own preferences - for example, one customer may always go to the club with the best music (the most Music attractions), and in case of a tie, the one that also has the best food. Two customers always remain face-down, because no one can entirely predict what the people will want on a given night. Each player has a random selection of attractions, which they distribute into 1-3 face-down stacks of cards to represent their clubs. There are four legal attractions you can add to each club (Music, Dancing, Food, and Prestige) and three attractions which, for arguments sake, are all currently illegal in your city (Liquor, Weed, and Gambling). Players are free to trade, buy and sell attractions, although doing so can tip off other players about which customers you're trying to attract. Customers have a cash value, and when a customer is awarded to a player, they become cash in hand. 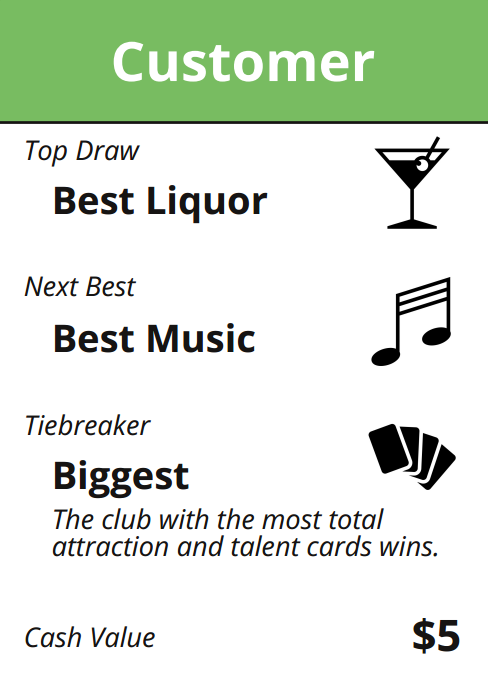 The goal is to create clubs that will attract as many of the available customers as possible, as the player who ends the fourth and final night with the most cash in hand wins. There's also a selection of "talent" available each night, and each player gets a turn to hire one or more of them to add to their clubs by spending cash, or in other words, discarding customers they've won. Talent add significant attraction bonuses to a club (some grant as many as 5 attractions, always including at least 1 Prestige) at a considerable cost, so they are often a risky investment. Lenient Cop - All contraband attractions and talent are discarded. Honest Cop - All contraband attractions and talent are discarded and the player is assessed a $10 fine (the cash value of 1 or 2 customers). 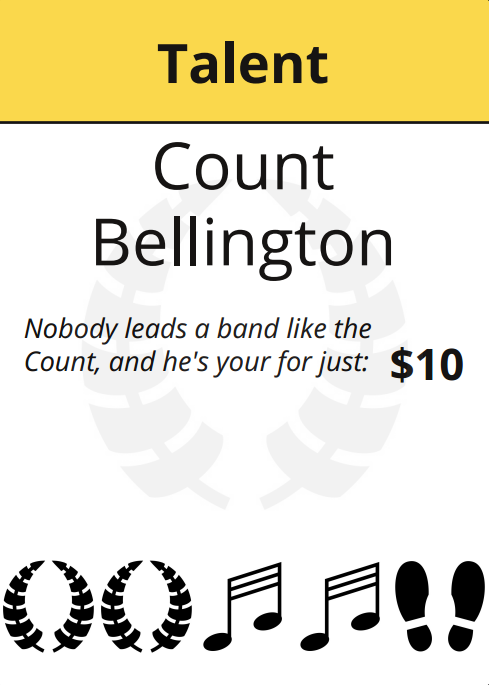 If the player doesn't have $10, they must pay whatever they have. Dirty Cop - The player must pay a bribe in the amount of $5 per contraband attraction card in their club. If they pay, nothing happens. If they can't pay or chose not to, the club is shut down; all cards in that club are discarded. It's a Raid - If any contraband is found, the club is immediately shut down. Blind Tigers is intentionally designed to be a small game. It was clear early on that a standard deck size wouldn't be enough for the game, so my more realistic goal was to limit myself to the largest deck that could reasonably fit in a tuck box. The Game Crafter offers a printable 108-card tuck box, so that seemed like the number to shoot for, even if I never end up getting this game printed. Set aside four cards worth of space to include a small instruction book, and that leaves 104 cards, so that's how big the game is. If I were to go to print with something like this, it looks like I would comfortably come in under a $10 MSRP, which sounds about right. I put some work into learning how to actually lay out cards for printing, in case I reach that point with this or any other game, and I believe Scribus and I are ready on that front. However, the version of the cards included in the download below is designed for easier print-and-play use, if anyone feels brave. The cards have crop lines but no borders, so any imperfect cuts won't be obvious, and I sacrificed having proper bleeds on the cards in order to get them to fit 9-up on an 8.5" x 11" sheet of paper, so there are only 12 pages to print. The cards are slightly undersized from standard poker card size, so they can easily be sleeved or glued to cards. I printed my test deck and sleeved them with blank cards, and the result worked very well for several test games. I put almost no work into any of the visual design, aside from the logo/icon/cover image. I tried to make the design of the cards simple and clear and easy to quickly parse visually using icons from game-icons.net, but aside from that, the entire game is extremely minimalistic. As is usually the case, a tabletop game created under the 1GAM constraints could use a lot more testing before I'm comfortable saying it's really good, but it seems to be playing well so far. Several test games went well, no obvious game-breaking optimal strategies were immediately found, and the play is fairly light and casual with a major element of luck while still giving players meaningful choices and rewarding intelligent play. Definitely a playable game, anyway, and I'm pretty happy with it.